Saitama Prefecture is the western part of the Kanto region, Tokyo is on the south, Gunma and Tochigi Prefecture is on the North, Ibaraki and Chiba Prefecture is on the east, and Yamanashi prefecture is on the west, so Saitama is an inland prefecture. 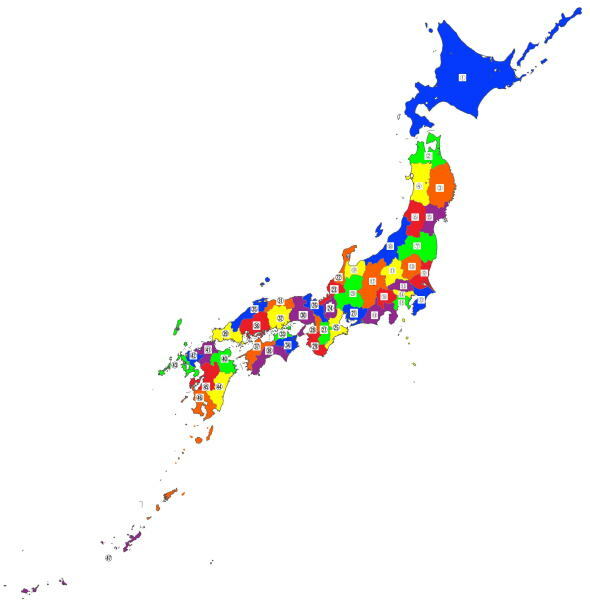 Therefore it has many highways to railroads (including Shinkansen) to northern part in Japan. In the eastern part of Saitama, Tone-gawa River, Ara-kawa River and Naka-gawa River pass through, on the western part of it, Chichibu Mountains lay down. Saitama prefecture has many tumulus, the Sakitama Kofun-gun (the cluster of burial mounds in Saitama) is very famous, the prefectural name Saitama is named after it. The history of the area was very long, Saitama originally belonged to the northern part of Musashi Province from the Taika era. And many people from Silla and Kokuryo settled in and cultivated the land in the basin of the Koma-gawa River, the Imperial Court in Nara offered them to move, so it registered the Koma-gun (Koma district) in the province in 718. In Medieval Ages, the Musashi Bushi-dan (a large group of samurais in Musashi Province) organized, the Chichibu Clan and its branch families, the Kawagoe Clan and the Hatayama Clan actively took part in. And also the Musashi Nana-to (the Seven groups of samurais) played in energetically. In 1180, Minamoto-no-Yoritomo, the founder of Kamakura Bakufu (the Kamakura Shogunate) at Kamakura in Sagami-no-kuni (Kanagawa Prefecture) and the first Shogun of the Bakufu raised his arm, and they voluntarily belonged to his arms. From Kamakura to Muromachi Period, the Kawagoe Clan and some clans related to the Heishi Clan controlled the area but its power was not so influential. After the Kawagoe Clan declined, Musashi became a stage of the conflicts between the Ashikaga Clan of the Kamakura Kubo (the chief warlord at Kamakura who was relative of the Shogun in Kyoto in Muromachi Period) and the Uesugi Clans of Kanto Kanrei (the shogunal deputy at Kanto Region), so Musashi Province was in the state of war. In 1457, Dokan Ota built the Kawagoe Castle, and after he was assassinated, the Ougigayatsu Uesugi Clan took the castle as their base and developed its power in southern part of the Musashi, during the Yamanouchi Uesugi Clan took the power in the north. In the Sengoku Period (the Warring States Period), the Go-Hojo Clan at Odawara in Sagami-no-kuni (Kanagawa prefecture) gained the power in Musashi and it took the Kawagoe Castle. To get the castle, there were several battles between the Go-Hojo Clan and the Uesgis Clans. In 1541, Tomosada Uesugi in the Ougigayatsu, Norimasa Uesugi in the Yamanouchi of the Kanto Kanrei and the Koga Kubo (the chief warlord at Koga in Shimousa who was relative of the Shogun in Kyoto in Muromachi Period) attached the Kawagoe Castle with over a hundred thousand samurai worriers. Then the Night Operation Of Kawagoe happened, Ujiyasu Hojo won the battle and gained the almost all provinces in the Kanto region under his influence. Ujiyasu suppressed Norimasa continuously, then he depended upon Kagetora Nagao who was the deputy military governor at Echigo (Niigata prefecture), and Norimasa handed over the headship of the Uesgi family and the title of Kanto Kanrei instead of getting his support. Kagetora later named Kenshin Uesugi. After Kagetora became the Kanto Kanrei, the conflicts between the Uesugi and the Hojo happend repeatedly in Musashi. After Hideyoshi Toyotomi won the Siege of Odawaran in 1590, the Hojo Clan ruined and Ieyasu Tokugawa moved to the Edo castle and also he gained the power to control the Kanto region. In 1603, Ieyasu gained the position of the Shogun who was the military leader of samurais could control Japan, so he founded the Edo Bakufu (the Edo Shogunate)in Edo. The area now Saitama Prefecture was divided into three districts to be controlled by three lords served the Tokugawa Clan since their ancestors. They took Kagagoe, Oshi and Iwatsuki as their bases. Especially, Kawagoe developed one of the industrial centers in Musashi and flourished, so it was named 'Ko-Edo', it means the little Edo (Tokyo). There were some highways and rivers to trade, and it was easy ways to bring agricultural products to Edo (Tokyo), then the suburban agriculture was developed. In 1868, after the Meiji Restoration, Musashi Province was finally divided into three districts, Saitama, Tokyo and Kangawa prefectures. Now the population in Saitama Prefecture is nearly 7 millions.